The Cochabamba Water Protests of 2000 provide a case study and warning of future problems to come for Cochabamba and other areas in Bolivia. In 2000, protests broke out over the privitization of Cochabambas water system and the subsequent hike in prices. The protests turned violent with government forces injuring hundreds of people and killing at least one person. The protests eventually ended with the government capitulating and revoking the private water contract. However, melting glaciers that create water scarcity coupled with vast wealth and income inequality make it so that political tensions are rising. The Cochabamba water protests that occurred in 2000 centered on the issue of water privatization in the city of Cochabamba Bolivia. Bolivia had switched from military rule to civilian rule in 1982 but hyperinflation and economic problems forced the Bolivian government to seek out the help of the World Bank and the IMF. As is often the case, the World Bank required that the Bolivian government undertake privatization of state industries to increase private investment. The thought process behind this is that "countries receiving loan assistance from the World Bank and the IMF are often discouraged from heavily subsidizing public services, as such expenditures counteract IMF and World Bank formulas for reducing debt, controlling inflation and attracting foreign investment" (Frontline). Many national industries were privatized and in this context the water rights were sold to a private company for the city of Cochabamba. Cochabamba is the third largest city in Bolivia and before privatization had a chronic water shortage with water being diverted to middle income and industrial sectors instead of the poor. Instead many of the poor had developed their own wells and water systems to deal with the water shortage. The World Bank saw the privatization of the water system as a way to solve this problem. The contract was given to the company Aguas de Tunari, which was part of the larger company International Water (Frontline). Due to the company’s desire to expand the water system as well as a relatively corrupt mayor who wanted an expensive dam project included, many people’s bills doubled in price. In response workers filled the center plaza of Cochabamba to protest the hike in water prices, which ended up injuring 175 people, blinding 2 people, and killing 1 person (Frontline). During the second protests the leader of the protests Oscar Olivera was arrested along with many others (Frontline). This resulted in mass protests across the country and the blocking of many of the countries highways. The Bolivian government in response declared that the country was under siege and further declared martial law (Frontline). That same day protests blocked off the entrances to Cochabamba where police fired tear gas into the crowds. The protests escalated into violence when an army captain shot into a crowd of civilians, killing a seventeen year old. The boy was Victor Hugo Daza and he was shot in the protest on his way home from a part time job by a mililtary sharp shooter. William Finnegan from the New Yorker write"By the time Daza had been raised onto his bier and the police and the Army had been repeatedly prevented from seizing his body, there was clearly no future for Aguas del Tunari in Cochabamba." (Finnegan). After this incident the government said they could not guarantee the safety of the water companies executives. The result was that Aguas de Tunari’s contract was ended and SEMAPA the public water company was reinstated over the municipal water source. A national bill was created that put social needs over economic needs and ensured local water sources that many of the poor relied on were protected. The problem that exists today is that because of the incidence there is reluctance on international companies to invest in Bolivia because of the incident. The problem today is that water scarcity still exists with the public water company, and water access has continued to flow to the wealthiest citizens and not the poor. The initial problem of water scarcity still exists with raising rates on water politically unfeasible. The Cochabamba protests started in January 2000 when peaceful protests erupted out of Aguas del Tunari raising the price of water. The protests turned violent from February 4-5 when the Coalition for the Defense of Water and Life (la Coordinara) during a peaceful protest were met by riot police, which started two days of violence. In the following month international attention was drawn to the conflict as protest ramped up in Cochabamba. 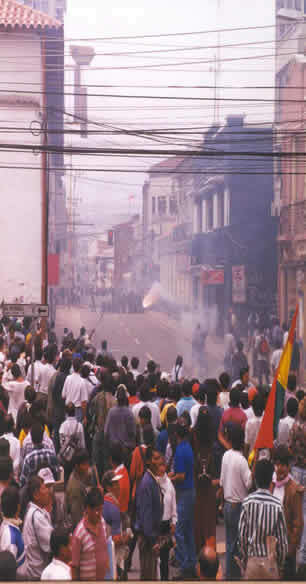 On April 3, 2000 the protests spread beyond Cochabamba to big cities like La Paz and surrounding rural areas. The protests culminated on April 8 with a 17 year old boy, Victor Hugo Daza, being shot in the protest by a mililtary sharp shooter while on his way home from a part time job (Finnegan). This infuriated the public and ramped up protest efforts that turned the tide in favor of the protesters. The government finally changed course on its support for the Aguas del Tunari water company on April 10 and signed a deal with La Coordinara to end the private water contract (Frontline). Overall, the conflict lasted 4 months. The location of the Cochabamba water protests was Cochabamba, Bolivia. Within Bolivia, Cochabamba is located in central Bolivia in a valley located near the Andes mountain range. 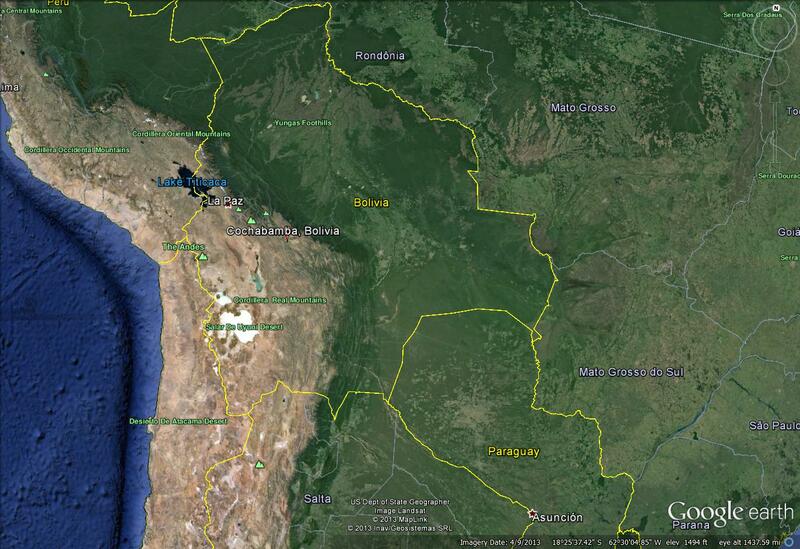 These maps show the relative location and metropolitan area of Cochabama in Bolivia. As one can see in figure 2 Cochabama is in a valley surrounded by mountains. Part of the water comes from glacial melt nearby. Aguas del Tunari was a subsidiary of Bechtel a large San Francisco based company that bought the water rights to Cochabambas municipal water source. Aguas del Tunari said it was hiking water 35% to expand water resources. Instead water prices for some people jumped 60%. Protest group led by Oscar Olivanara that marched to end the privitization of water. Had to go into hiding, but negotiated the release of detained protesters and the repeal of the water privitization law. Passed the law 2029 which gave a 40 year water and sanitation contract to Aguas del Tunari. After the dictatorship ended in Bolivia in 1985, the IMF and World Bank pushed Bolivia to undertake neoliberal reforms and privitize. World Bank argued that the lack of piped water to poor areas was because of a corrupt government and that if Cochabamba privitized its water resources then the market would be able to expand water to the poor. The tropical Andes region of Southern South America which includes Peru and Bolivia as well as Patagonia will be severely threatened by the rapid pace of glacial retreat. The rapid glacial retreat has been due to rising temperatures caused by climate change. In 30 years glaciers in Bolivia and Peru have decreased in mass by 30 to 50% (Rangecroft). In Bolivia, glaciologists have seen glacial retreat of 48% between 1963 and 2006. In 2009 the Chaclataya glacier completely disappeared; six years before expectations (Rangecroft). La Paz receives 15% of their water from glacial melt in the wet season and 27% in the dry season ("Andean Water"). In the figures below from the 4th IPCC report there has not been significant increase in temperature but over the next century projection suggest that they could rise anywhere from 2 to 3 degrees Celsius. However, scientists are unsure of how this will affect the region. Some predict that the increased melt will cause an increase in the water supply in the short term, but will cause long term problems. Others predict that the wet season could see more water, but less water in the dry season. Either way, experts agree that it will add another level of vulnerability to the urban and rural water supplies (Oxfam 23). Recently, La Paz, for the first time, asked for citizens during Carnival to limit their water use. This will increasingly be a common occurrence, but the way climate adaptation is undertaken could created climate conflict.The problem is that as glaciers melt there is resulting increase in water flow that creates floods. These floods do damage to low lying areas, but as the glaciers disappear forever, drought takes affect that damges crops further.According to the IPCC 4th assessment report "Many small glaciers, e.g., in Bolivia, Ecuador, and Peru, will disappear within the next few decades, adversely affecting people and ecosystems. Rapid melting of glaciers can lead to flooding of rivers and to the formation of glacial melt-water lakes, which may pose a serious threat of outburst floods" ("Flood and Drought" IPCC). Around the world other glacial reliant areas are experiencing simliar problems. In the Himalayas, which glacial water supplies water to 500 million people, are at risk for Glacial Lake outbursts (Perera). This is where the glacier holds back water and when seismic activity breaks the glacier a flood of water occurs. This is not new, but water is accumulating faster than before threatening a tsunami of water from being released (Perera). In Cochabamba a representative from an Italian water charity said "While Cochabambinos were able to reclaim their water supply from a foreign company charging unreasonable rates, there are still serious water problems in Cochabamba. This is mainly because the city’s population is continuing to grow, while the amount of water to go around stays the same." (Eastwell). Flooding as glaciers retreat followed by drought all while there is an increase in migration will make water scarcity a very serious problem in the next 30 years. The type of conflict that arose is rooted in the problem of inequality and poverty in Bolivia. The environmental problem that water scarcity existed and was getting worse due to glacial melt meant that there was less water being supplied to the city. However, the main problem was that the poorest areas of the city were not receiving piped water while the rich sections were. Privitization was a response to expand resources, but created the conflict over if water is a human right. The protest arose over the ability of the people to receive and utilize water without restrictions from a private company hiking prices. However, the protests of 2000 did not solve the problems of unequal distribution of water and dwindling water resources. In the future the type of conflict and its origins might change. With increasing droughts there could be a clash between agriculture and urban areas over usage of water. As seen in Cochabamba, many of the poorest residents created their own wells so as to tap the water that was not being provided to them. If water increasingly becomes scarcer, more residents will start tapping into the water system outside of the state SEMAPA Company possibly depleting water sources further. Drought over the past years has caused massive wildfires as well as huge food shortages. This has required a lot of outside assistance as more people are moving off the land and into the cities. The urbanized population in Bolivia has risen from 45% of the population in 1980 to 67% today (World Bank Database 2012). Scientists from the University of Florida found that in the past 300,000 years ago during a warming period Lake Titicaca lost 85% of its volume causing the surrounding area to turn into a desert ("Study: Warming Could Tip Bolivia Drought"). With the rapid increase in temperature due to climate change the loss of water would threaten the 2 million people who live around the capital of La Paz and force even more people to move into the cities. Out of the indigenous urban population 65% lived below the poverty line compared with 50% of nonindigenous people below the poverty line (Gigler 7). One economist noted that "The economy is divided into (i) a formal sector dominated by mestizos and closely linked to global markets through the export of natural resources and the inflow of international investments, and (ii) a rural and informal sector of primarily indigenous peoples reliant on a combination of subsistence agriculture, informal commerce, and temporary or permanent labor" (Gigler 30). Since the indigenous people are more reliant on agriculture they are more affected by scarcity of water and since they are more connected to the informal sector in the cities they are paid less and less connected to the water system. The problem in Bolivia is a two prong problem. The first is that glacial melt and intense draught are beating predictions. Currently cities like El Alto on the outskirts of La Paz have had taps dry out. This is causing a problem where people are moving to the cities from the countryside because of lack of water, but when the people arrive they find that the cities are running out of water as well. The second problem is government mismanagement of the resources. Even after the Cochabamba Water Protests and water was named a human right, cities like El Alto and La Paz do not have full time water technicians. As these water resources run out it has further destabilized class relations as rich residents continue to receive water while poorer neighborhoods have been cut off. The Cochabamba Water Protests of 2000 seem to not just be a phase to thwart neoliberal encroachment on resource management. They seem to be much more predictive of what will happen in the future. The protests turned violent once the government felt that they were threatening the elite of the country and private interests. Evo Morales was elected as the first indigenous leader of Bolivia after years of rule by the white minority. While one would think that the major clashes would be between the rich white and the poorer indigenous, even indigenous groups were angry over plans to build roads through the Amazon which resulted in mass protests and riot police being dispersed (Friedman-Rudovsky). Eventually, Morales called off the project, but the incident highlights the fact that indigenous groups are still willing to mobilize in the face of government actions and the government is still willing to respond with force (Friedman-Rudovsky). If water scarcity leads to further class tensions we could see coups or mass protests against the ruling elite. It also could lead to the reverse where the elite feel threatened by the poor demanding more water rights so they themselves take over the government. As more and more people move to the cities it will require better management of the public water infrastructure and Bolivia being a relatively mismanaged country this could lead to tensions that may eventually turn violent. In 2009, water was listed as a right in the Bolivian constitution to stop the privitization of the resource, but making it a right only highlight that much more the contrast in the inequality. The level of conflict started off low and escalated into a national protest. Over 200 people were arrested 175 protesters and 51 police were injured. There was one reported fatality of 17 year old boy Victor Hugo Daza. The first causal loop maps out the regions problem with water scarcity. In this case warming temperature caused by anthropogenic climate change leads to glacial melt. As glacial melt increases water scarcity increases as there is a less steady flow of water to the region. The impoverished agricultural regions of the Andes then have decreasing returns caused by decreased water. This leads to many from the countryside moving to the urbanized areas, which further pulls from the declining water system. This sets in motion a feedback loop that ends up increasing migration while decreasing available water resources. As pointed out before, La Paz receives 15% of their water from glacial melt in the wet season and 27% in the dry season ("Andean Water"). A decrease in a quarter of the water source has the potential to create conflict as scarce resources will most likely get funneled to the rich. This leads to the second causal diagram, which maps out how part of this scenario played out in Cochabamba. 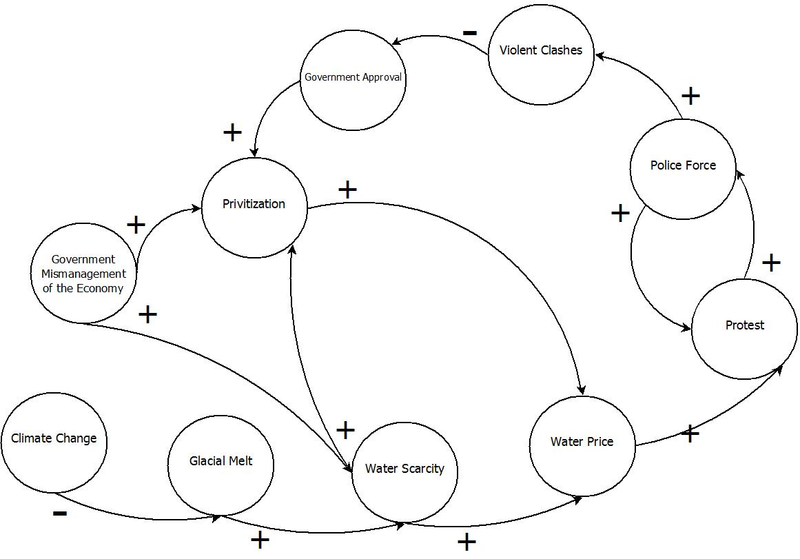 The second causal loop diagram maps the causes and feedback loops of the original Cochabamba Water Protests in 2000. 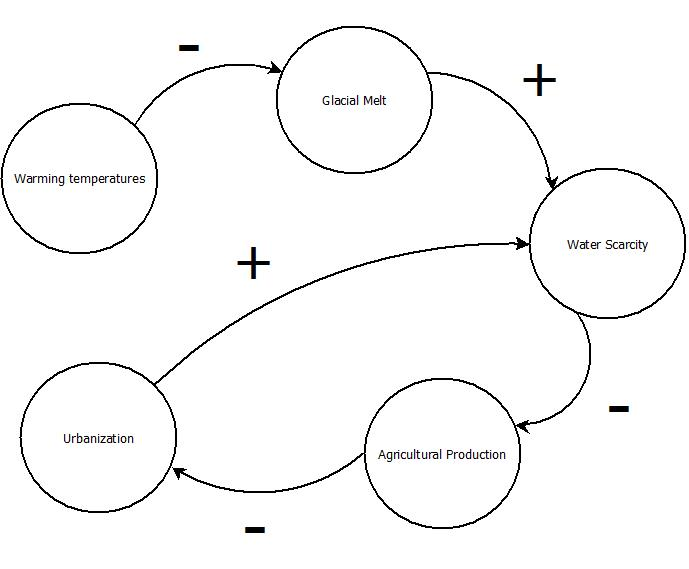 The causal loop diagram starts with two separate but related factors, Climate change and governmental economic mismanagement. Government economic mismanagement causes an inefficient allocation of resources which deplete the water source. In 2001, 75% of the central richer part of the city had piped water while 75% of the poorer southern part of the city lacked piped water (Ledo 10). This central part of the city also consumed 48% of the water resources even though they only represented 30% of the population (Ledo 10). Economic mismanagement also causes international institutions, such as the World Bank in the Cochabamba case, and businesses to push for privatization of key industries, as a way of reducing inefficient government and external debt reduction. Climate change causes glacial ice to melt thus decreasing the supply of fresh water even further, leading to more water scarcity. Privatization allows foreign companies to expand water resources, but to do so they need to increase the water price. This occured with Aguas del Tunari increased the price of water in some areas by 100%. At the same time a decrease supply in water also increases water prices. The increase in water price then leads to protests over the increase which is responded to with an increase in police force to quell the protest. This leads to an increase in more protest out of anger at the government’s response to protect private business. An increase in police forces eventually leads to violent clashes which decreases government approval. In Cochabama this resulted of hundreds of injuries and one death. With decreasing government approval, the government revokes private contracts and returns to municipal water source, which then lowers water price but continues to feed into the problem of water scarcity. The significance of the causal loop is that Bolivia is back where it started with no current means of solving their water scarcity problem. The privatization water model was an experiment created by neoliberal institutions to decrease government involvement in the economy. Their concern was not primarily to solve the water scarcity problem created by climate change. Privatization failed due to the fact that middle class citizens were not able to receive affordable water anymore. The poor before privatization were not connected to water in the first place so they used informal means to obtain water. Once private companies came in, they banned the poor from getting their own water. This causal loop tries to show an issue that if government cannot regulate and make sure everyone gets water and private companies destroy the concept of water as a human right then we are stuck in this loop that either creates more scarcity or rations water so much that people cannot live their normal lives. There is a great potential for violent conflict in the future due to the extremely unequal nature of Bolivian society. While Evo Morales represents the first president of Bolivia with Native Bolivian backgrounds, the white rich upper class controls most of the economy. Since the transfer back to a municipal water source, Cochabamba has seen a return to a system where the upper and middle class neighborhoods receive water and the poor do not seen in the fact that 30% of the population controls 48% of the water (Ledo 10). As the water decreases and feeds into this causal loop the government will have to ration out the water even thinner. This has the potential of going only to the very rich and antagonizing class conflict. Overall, this causal loop tries to link together governmental, economic, and environmental factors to show how conflict arisee in Cochabamba. Turbulent climate patterns have been a part of this region for a long time. The Chimor kingdom, that existed in neighboring Peru, provides a great example of a civilization that was able to adapt to climate shifts during the medieval warming period. 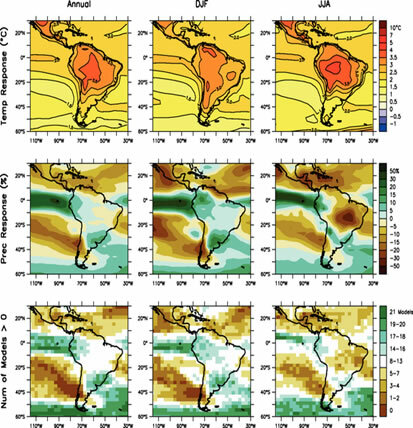 The coastal regions of Peru, like Bolivia, were greatly affected by El Nino cycles of floods and droughts. During the medieval warming period, 4 major droughts existed culminating in a large drought from 1245 to 1310 (Fagan 159). While civilizations like the Tiwinaku faltered other states such as Chimu were able to thrive and expand. Fagan states that “Droughts and El Ninos were realities etched into every coastal farmer and fishers minds. Both arrived without warning and at irregular intervals.” (Fagan 164). The Chimu State was able to adapt to these intense irregular weather patterns by investing in food security. Unlike the Moche people that came before them, instead of building large pyramids they built large cities such as Chan Chan and divested power to local elites. The problem of having a large centralized population of artisans and other craftsmen meant that they needed a large food structure to feed the non-farmers who lived in the city (Fagan 166). Chan Chan depended on large step down water wells for water, but forced labor also built extensive irrigation canal systems that relied on a timetable of water delivery to different areas. Different parts of the canal were able to operate even if parts of it were destroyed by floods or dried up during droughts (Fagan 169). The Moche, who came before the Chimor, used to move their villages in response to droughts or flooding (Fagan 168). The Chimor who were more established, created large storage reservoirs. The differing response between the Chimor and the Moche reflect a difference between climate preparedness today in Bolivia. The Moche responded to climate crisis by migrating, much like the rural people of Bolivia today. The Chimor, however, invested in climate adaptation, which will have to be a solution if Bolivia is going to support the increasingly urbanized areas of the country. Despite similarities, as seen in table 1, Chimor was a rigid hierarchical society that could forcibly build water systems while modern Bolivia is a democracy, which comes with its limitations. The end of the Chimors occurred when the Incan empire was able to take control of the watersheds that supplied the kingdom its water, reflecting a theme that is consistent to today that power lies where the water exists. This example highlight problems that Bolivia is dealing with now with migration to the cities as well as the way environmental problems and change have been responded to in the past. Forced Labor, State relied on water control, Incans were able to control this. Lack of water infrastructure/ water inequality. Water as human right. Rich state with hierarchical rule. Large cities supported by rural irrigation system. The past presents a great example of what Bolivia and the region will have to deal with in the future. The example of the Moche versus the Chimor highlights the problem of migration versus coordination as adaptation means. Conflict arose between the Chimor and the Incan people over water resources. This could be a consequence in the future if Peru and Bolivia are both trying to fight for the same depleting glacial water. This case has implications for the entire Andean region and much of Southern South America. As seen in the graphic below, the Andes will be one of the most water stressed regions in the world with decreasing amount of water per person. These countries might have to deal with internal migration from water scarce areas to water rich areas, which could cause conflict with various indigenous groups that live in the surrounding areas. Since these areas provide some of the world most important natural resources such as copper, water scarcity could affect these industries that will have implications on a world wide scale. Figure 5 shows areas of water stress in the year 2050 from the Centre for Envrionmental Systems Research. The red areas indicate levels of extreme stress. The top of Chile and the western part of Bolivia are both areas of extreme stress, which could create conflict since Chile and Bolivia have a tense relationship since Bolivia lost its access to the ocean in the War of the Pacific to Chile. From 1879 to 1883 Chile fought a war against Bolivia and Peru over access to minerals and resources. Chile ended up winning and gaining about a third more territory than it had before the war. This resulted in a loss of access to the sea by Bolivia, which until this day presses Chile to regain access. As a result Bolivia refuses to provide Chile access to its natural gas reserves, which must instead import gas from countries much farther away. Recently, Bolivia took Chile to the International Court of Justice to regain access to the Pacific Ocean, which Chile firmly denies. If water stress increases it might add new importance for Bolivia to gain access to the ocean. The initial Cochabamba Water Protests were concluded when the government terminated the water and sanitation contract with Aguas del Tunari. "Distribution of Family Income- Gini Index." The World Factbook-CIA. N.p., n.d. Web. 11 Dec. 2013. <https://www.cia.gov/library/publications/the-world-factbook/fields/2172.html>. Friedman-Rudovsky, Jean, and Yungas Valley. "Bolivia's Long March Against Evo Morales: An Indigenous Protest." Time 21 Oct. 2011: n. pag. Web. 11 Dec. 2013. <http://content.time.com/time/world/article/0,8599,2097142,00.html>. Gigler, Bjorn Soren. "Poverty, inequality and human development of indigenous peoples in Bolivia." Georgetown University Center for Latin American Studies 17 (2009): 3-38. Web. 11 Dec. 2013. <http://pdba.georgetown.edu/CLAS%20RESEARCH/Working%20Papers/WP17.pdf>. "Income share held by highest 10% in Bolivia." TRADING ECONOMICS | 300.000 INDICATORS FROM 196 COUNTRIES. N.p., n.d. Web. 11 Dec. 2013. <http://www.tradingeconomics.com/bolivia/income-share-held-by-highest-10percent-wb-data.html>. Rangecroft, Sally, Stephan Harrison, Karen Anderson, John Magrath, Ana Castel, and Paula Pacheco. "Climate Change and Water Resources in Arid Mountains: An Example from the Bolivian Andes." Royal Swedish Academy of Sciences Review (2013): 855-57. Springer. Web. 14 Nov. 2013. "Regional Climate Projections." IPCC 4th Assessment Report 11.4 (2007): 894-95. Web. 14 Nov. 2013. <http://www.ipcc.ch/pdf/assessment-report/ar4/wg1/ar4-wg1-chapter11.pdf>. "Andean Water 'sponges' Being Squeezed by Changing Climate." BBC News. BBC, 09 Apr. 2013. Web. 15 Nov. 2013. <http://www.bbc.co.uk/news/world-latin-america-23944385>. Ledo, Carmen. "“Inequality and Access to Water in the Cities of Cochabamba and La Paz-El Alto”." United Nations Research Institute for Social Development (2004): 1-52. Web. 15 Nov. 2013. <http://www.unrisd.org/80256B3C005BCCF9/(httpAuxPages)/26E864C81E9E705AC1257A52005B583C/$file/Bolivia%20Water.pdf>. "The Key Effects of Climate Change." BBC News. BBC, 12 Aug. 2009. Web. 15 Nov. 2013. <http://news.bbc.co.uk/2/hi/science/nature/7821082.stm>. World Bank. (2012). Data retrieved November 15, 2013, from World DataBank database. Carroll, Rory, and Andres Schipani. 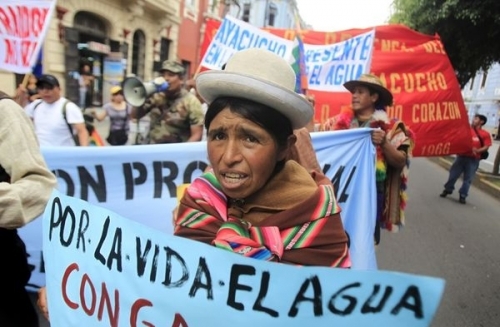 "Bolivia: water people of Andes face extinction." Guardian [London] 23 Apr 2009, n. pag. Web. 13 Sep. 2013. <http://www.theguardian.com/world/2009/apr/24/andes-tribe-threat-bolivia-climate-change>. "Study: Warming could 'tip' Bolivia drought." UPI[Washington] 01 Sep 2010, n. pag. Web. 13 Sep. 2013. <http://www.upi.com/Science_News/2010/11/12/Study-Warming-could-tip-Bolivia-drought/UPI-83501289609137/>. "FRONTLINE/WORLD . Bolivia - Leasing the Rain . 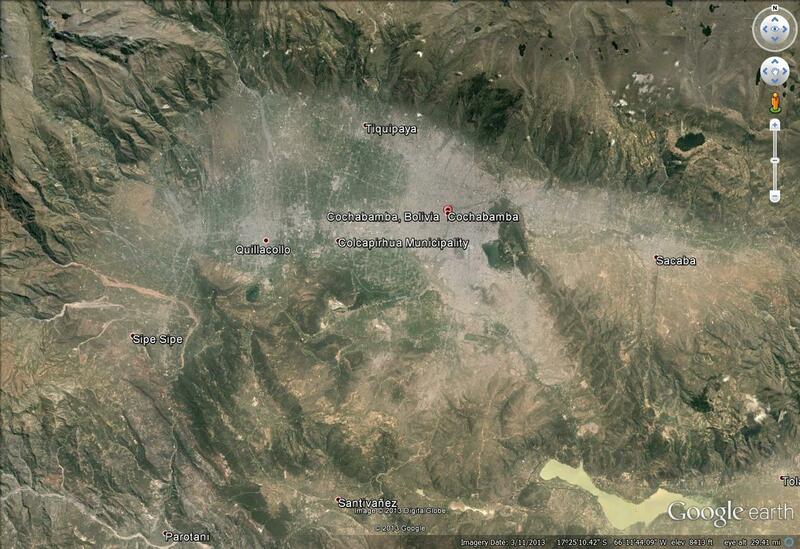 Timeline: Cochabamba Water Revolt | PBS." PBS: Public Broadcasting Service. N.p., June 2002. Web. 12 Dec. 2013. <http://www.pbs.org/frontlineworld/stories/bolivia/timeline.html>. Finnegan, William. "Leasing the Rain." Internet Archive: Wayback Machine. The New Yorker, 8 Apr. 2002. Web. 12 Dec. 2013. <http://web.archive.org/web/20070929151555/http://www.waterobservatory.org/library.cfm?refID=33711>. Perera, Amantha. "Fears Grow of a Himalayan Tsunami as Glaciers Melt." Time 27 May 2013: n. pag. Web. 12 Dec. 2013. <http://world.time.com/2013/05/27/fears-grow-of-a-himalayan-tsunami-as-glaciers-melt/>. Eastwell, Jessica. "Water Supply in Cochabamba: Finding a Balance." Cocha Banner Magazine. N.p., June 2011. Web. 12 Dec. 2013. <http://www.cocha-banner.org/issues/2011/june/water/>. "3.4.3 Floods and droughts - AR4 WGII Chapter 3: Fresh Water Resources and their Management." IPCC - Intergovernmental Panel on Climate Change. IPCC, n.d. Web. 12 Dec. 2013. <http://www.ipcc.ch/publications_and_data/ar4/wg2/en/ch3s3-4-3.html>. Fagan, Brian M. "The Lords of Chimor." The Great Warming: Climate Change and the Rise and Fall of Civilizations. New York: Bloomsbury Press, 2008. 155-172. Print. "Cold Snap Prompts Chile to Seek Gas Deal with Old Foe Bolivia." The Christian Science Monitor. The Christian Science Monitor, 08 Aug. 2007. Web. 15 Nov. 2013. <http://www.csmonitor.com/2007/0808/p12s01-woam.html>. "Landlocked For A Century, Bolivia Now Wants Access To The Sea, Asks Chile For Help. "International Business Times. N.p., 14 June 2013. Web. 15 Nov. 2013. <http://www.ibtimes.com/landlocked-century-bolivia-now-wants-access-sea-asks-chile-help-1307917>.